It came with new couplers, t-bolt clamps, and lower charge pipe upgrade (not pictured). Luckily, I already had a lower charge pipe installed with couplers from my previous VRSF intercooler. 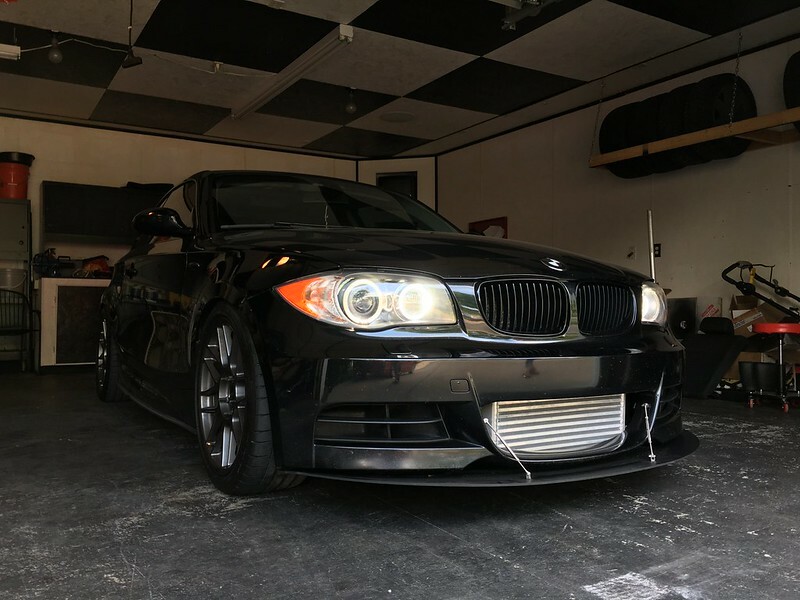 I left them all in place to save time and was able to just swap out intercoolers after trimming things to fit the larger intercooler. 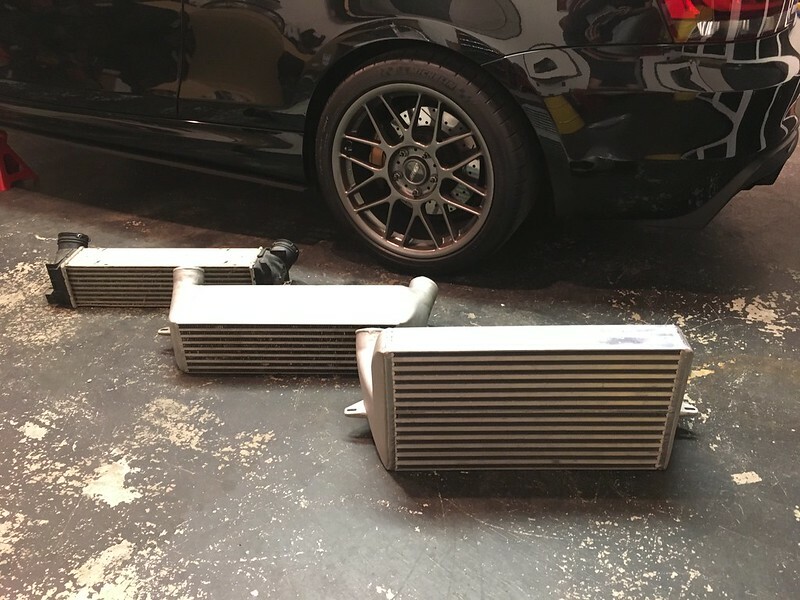 I kept the new supplied hardware to sell with my previous intercooler. 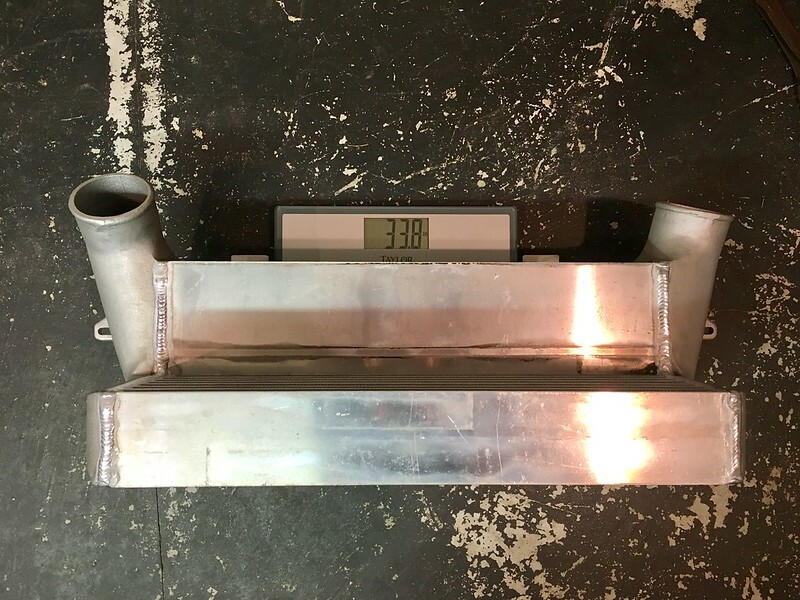 Stock vs. Standard VRSF Street 7″ vs. VRSF 7.5″ Race intercooler. 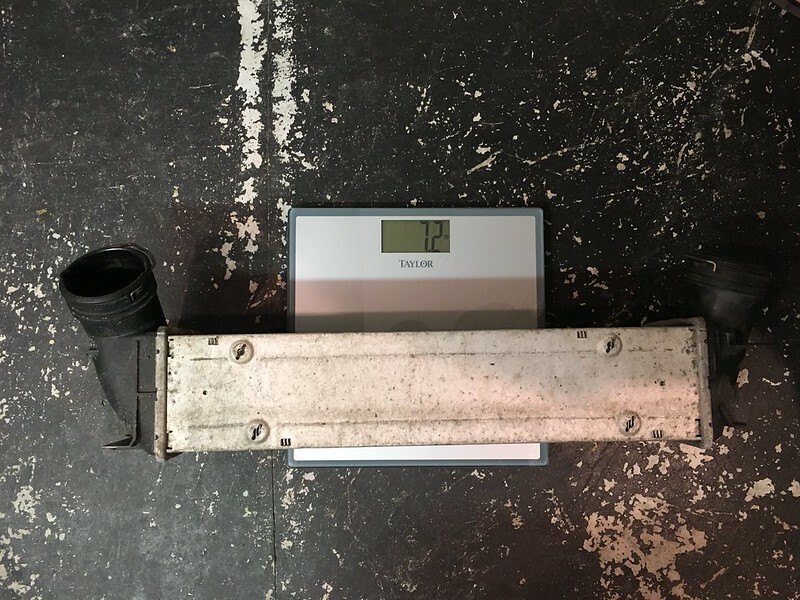 Definitely larger and definitely heavier. 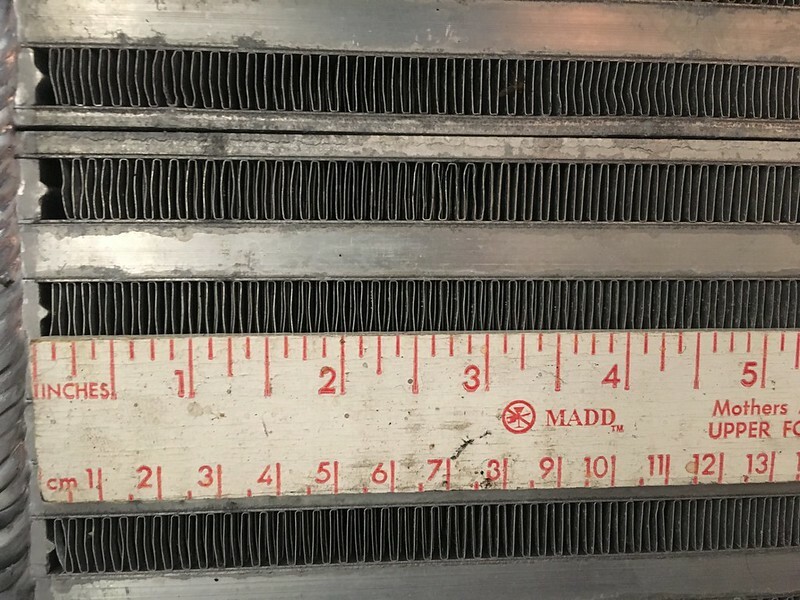 Let’s take a closer look at the fin density and cooling bar size. Much better! The 7.5″ Race version has a much denser fin pack and larger cooling bars. Now let’s get this thing in the car! It required A LOT of cutting and trimming. Seriously. If you don’t have a Dremel kit like this, you should get one. I thought this would be enough, but I was wrong. 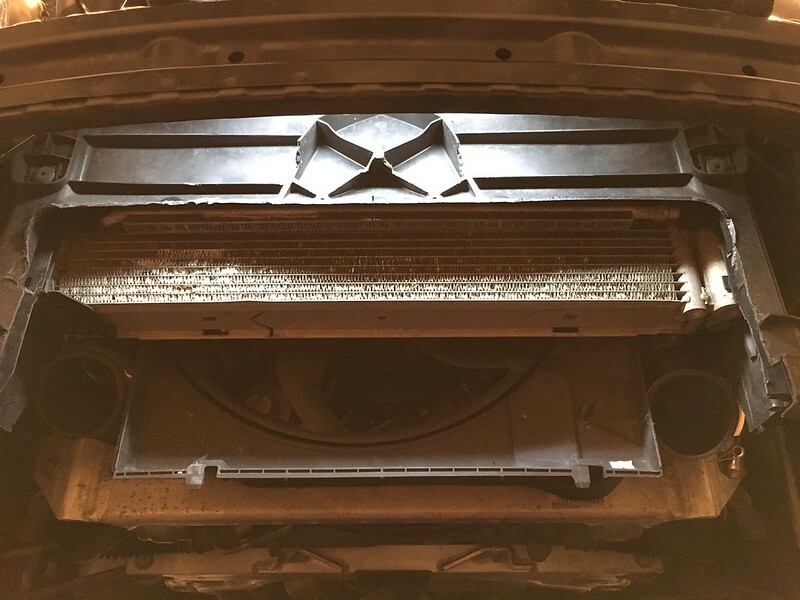 I had to cut even more before I could fit this intercooler up in there. However, I knew I would have to cut quite a bit of plastic to fit something this large. 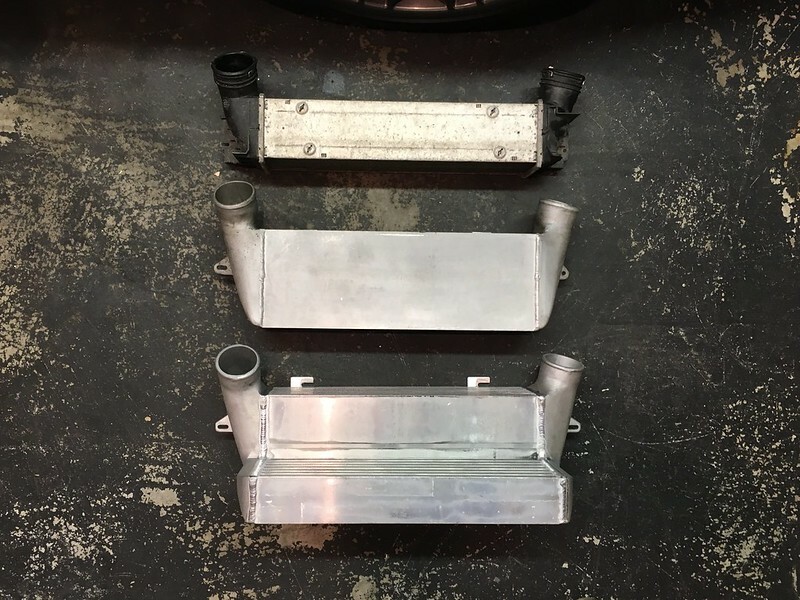 At least I was combating the weight of the heavier intercooler by removing tons of plastic, right? 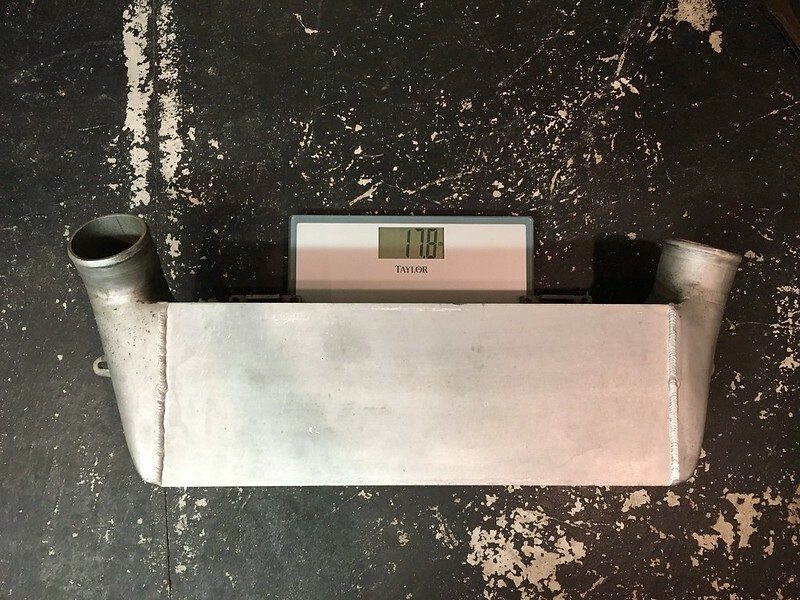 My previous intercooler allowed a 54° rise in intake air temperature during a 28psi 60-130mph pull. 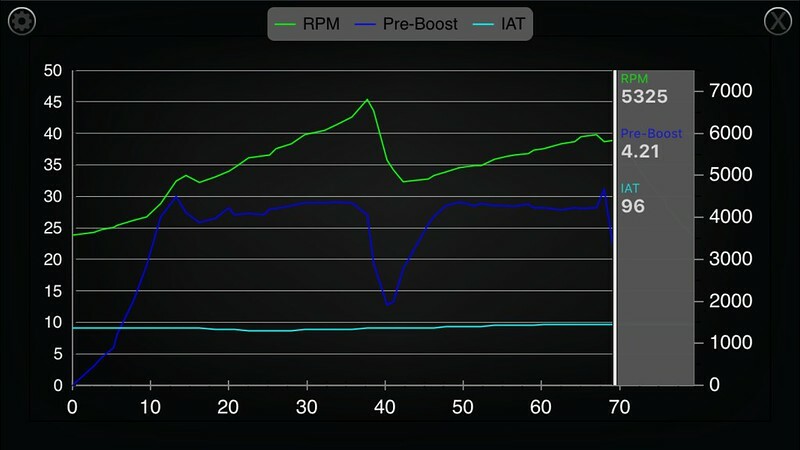 The new 7.5″ Race intercooler only rose 5° during a similar pull with similar ambient temp. It actually went down during the pull with more air flowing through it. See the light blue line on my logs. 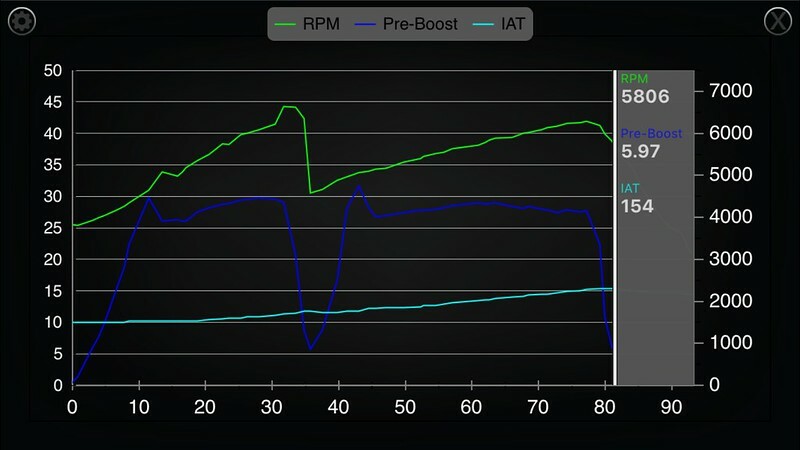 I took a peek at the turbo’s duty cycle to see if they were having to work any harder with the larger intercooler, but their WGDC stayed around 50%. The water temperature was also unaffected by the stepped design that covers part of the radiator. 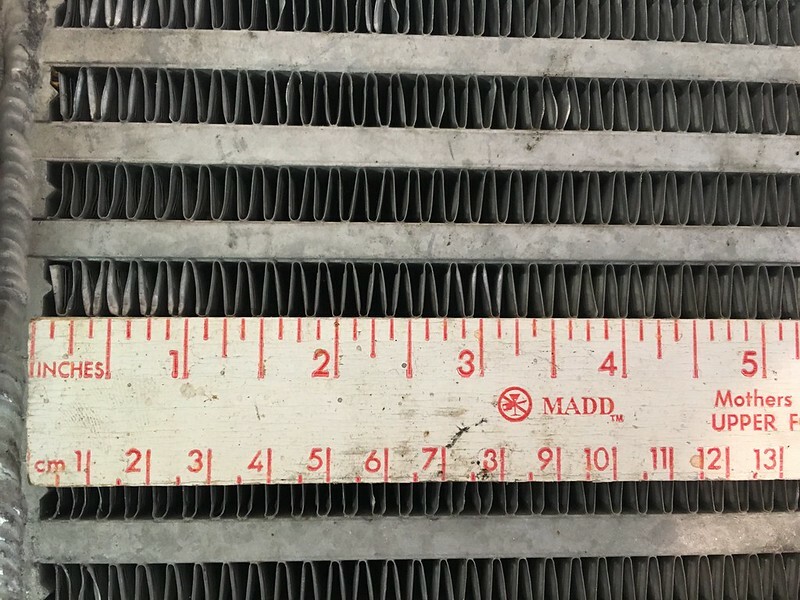 Both intercoolers allowed for a 10° rise in coolant temperature. It looks like the straight-through fin design still allows plenty of air to reach the radiator. Overall, very happy with the results! 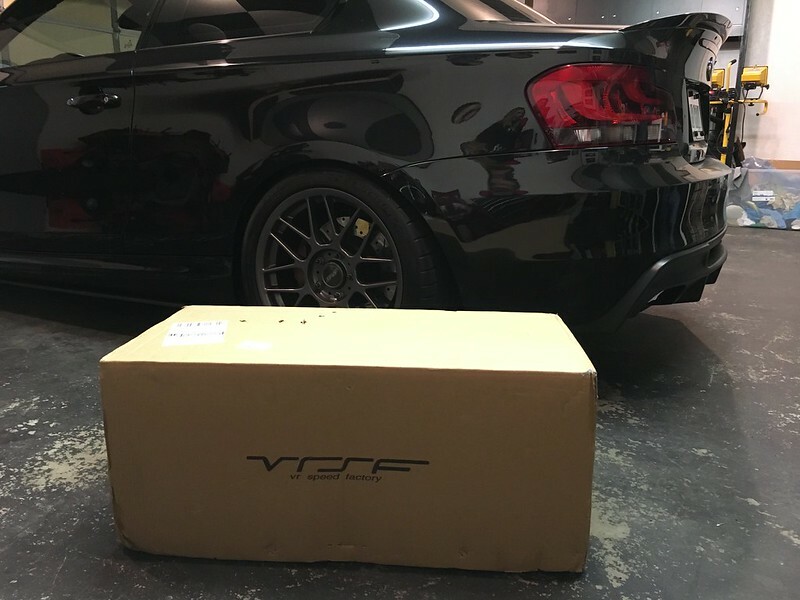 I’d highly recommend the VRSF 7.5″ Race intercooler to anyone looking to cool things down a bit. 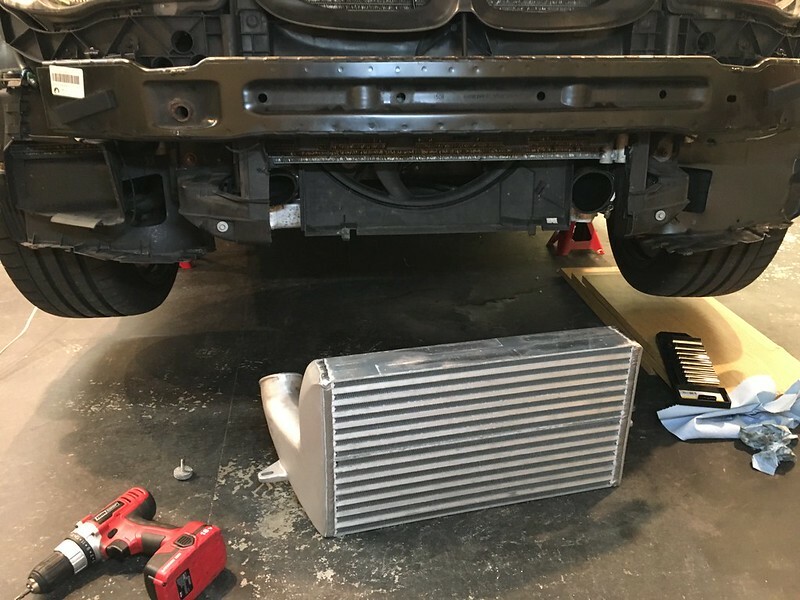 Aside from the trimming, I don’t see any reason why you wouldn’t choose this intercooler over their other options.